AP Bord of Inter Mediate Education Andhra Pradesh Conducting Inter First Year and Second Year Annual Exams 2016 Conducting in the month of March - 2016 . The Examination of First Year and Second Year Annual Exams Will be held on 11th or 12th March-2016. 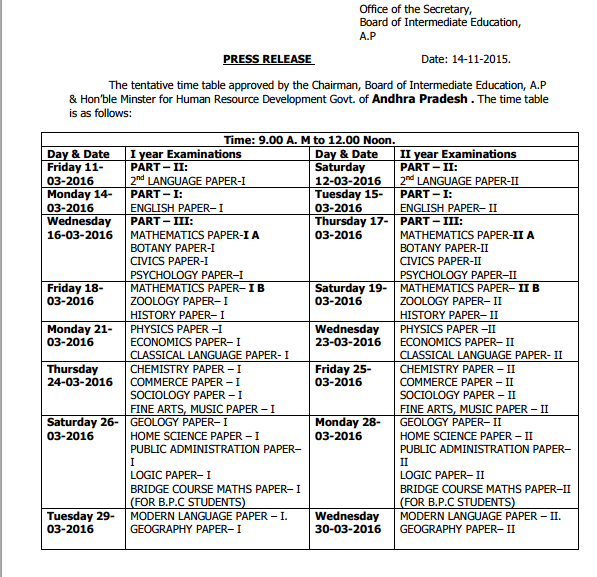 Before commencement of these examination the board will release Time Table of the Examination Scheduled. All the students are awaiting from declaration of Inter mediate Examination 2016 Scheduled of Time Table which will be conducting likely in the month of March - 2016.